Solatorobo: Red the Hunter isn’t a game title that is likely to storm to the top of the sales charts. There are no well-known franchise names, no mainstream marketing campaign, and no hint of generic, dull gaming characters and designs. Being a Japanese action RPG, this game is different from the vast majority of titles out there and, in this case, different is most definitely a good thing. It's difficult to summarise the storyline in Solatorobo, especially as we want to keep this review as spoiler free as possible. The storyline is, however, an integral part of the game, rather than a vehicle to allow the developers to throw levels together. The main arc of the story is lengthy and full of twists, surprises and unexpected tangents. This is all reinforced by strong writing, with high quality localised text exuding charm and wit; often funny, at other times sentimental and often touching, on other occasions full of serious storytelling. Considering that the storyline is set in a world of floating islands above the clouds, with dog and cat-like denizens flying spaceships and riding robots, it’s impressive how the plot draws you in. You play as Red Savarin, a ‘hunter’ who rides his robot, Dahak, through a variety of environments and challenges. His main companions are his adopted sister Chocolat, and mysterious feline friend Elh. Red’s duties as a hunter for hire draw him into a series of events that, ultimately, rest on saving the world. 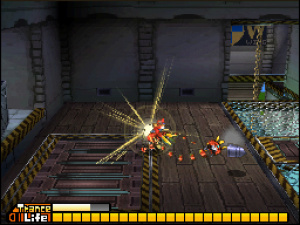 The ‘save the world’ storyline is a staple of gaming, but it’s executed particularly well in Solatorobo, as it develops into a tale about Red himself, his origins and how he came to be a robot-riding hunter. The cast of other characters is impressively varied, with some that are friends, others who are enemies, and a few that are a bit of both. As the 20-hour-plus campaign progresses, the storyline maintains its momentum, and you’re more than likely to be anxious to know what happens. Storyline is imperative, then, and you do spend long periods reading text and watching cutscenes. Thankfully, the gameplay integrates well within this presentation. This may be an RPG, but as an overall experience it is simplified, with many of the genre’s elements relegated to a secondary role. That said, there is levelling up to be done in multiple areas — in terms of Red’s abilities, you can increase your health allocation by gaining experience points from battles, as well as purchase upgrades for your robot. You can boost Dahak’s abilities, gain extra slots for items with power cell pick-ups, and later in the game even purchase multiple robot models. Red’s hunter rating is also increased by completing quests, which becomes necessary to progress in the adventure. These upgrades are important and have a noticeable impact on your robot’s performance. Your actions in the game are mostly performed with Dahak, with some puzzle oriented moments running around on your own, and it is always intuitive and easy. Movement is with the D-Pad, you jump with B, while the X button gives access to a useful sub-menu where you can customise Dahak or view an objective reminder. It's the A button that will get the most use, as the combat mechanics require repetitive tapping to lift and throw items and enemies. Rather than turn-based battle, the action-infused combat in this title requires you to wait for an opportune moment and then flip the enemy over, after which you can throw them into the ground, walls or other enemies. You can perform combos to increase damage, which require good timing, but the overall process basically involves tapping the A button; good exercise for your right thumb. This fight mechanic sounds extremely simplistic and, in essence, it is. It is surprisingly satisfying, however, and brings dynamism to the many battles that you’ll fight. Such is the nature of the system, most battles are over very quickly, so you’re not mashing the A button for long periods. If, however, you do encounter a lot of battles in a short space of time a feeling of repetition can set in, though it's short-lived, as the game has more up its sleeve than merely fighting enemies. In fact, it's the variety in the game’s 80 quests that serves as its strong suit. Some quests, such as puzzles involving moving crates or catching photo-stealing kittens, still involve running around and tapping the A button, but the focus is sufficiently varied to keep you interested. In addition, there are some major departures in gameplay; these include a well-implemented but underused free-flight mechanic, quiz events that test your memory skills, as well as hovercraft racing sections that involve flying through a variety of tracks while picking up boosts and weapons to disrupt opponents. In fact, these racing sections are included as an extra mode, Air Robo GP, which features unlockable vehicles and six tracks to choose from. If you have friends who own the game, there is a multi-card multiplayer option for up to four players, allowing you to race against each other. Within the adventure itself, there’s a myriad of items and pieces of lore to buy, unlock and discover: these include music tracks, photos, descriptions of the world’s history and cutscenes that can be viewed at any time. Another extra feature is downloadable quests, the first of which was released on 15 July. In order to play these you need to finish the main adventure, but they're a nice bonus. If there is one complaint to be made about the gameplay, it's the difficulty. Experienced gamers may breeze through this game, potentially without seeing the ‘game over’ screen once. On the positive side this didn’t detract from our enjoyment of the title, and does mean that less experienced gamers should be able to pick up and play, but some may pine for a greater level of difficulty. Solatorobo, as we’ve shown, provides a substantial amount of content and gameplay variety. Developers CyberConnect2 have successfully brought this content together in a package that is pleasing on the eye. In-game graphics and cut-scenes are impressive for the DS hardware, and the multitude of island locations are a particular standout; mining towns, shipwreck sites and grand cities all come alive with detailed backgrounds. Also included are a couple of attractive animated sequences that set the tone for the adventure ahead, though the perceptive among you may pick up a few plot spoilers. Sound design is mixed: music is excellent and has a nice chiptune style, but there are a few sound effects, such as when Red jumps, that sound slightly compressed and distorted. Finally, special mention should go to the game manual, which includes gorgeous colour artwork and plenty of background information. 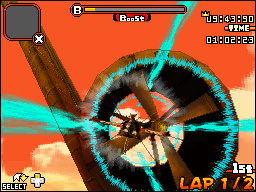 Solatorobo: Red the Hunter is a game that we highly recommend. It has been crafted with care and in painstaking detail, incorporating a lengthy, well-written story with engaging battle mechanics and an impressive variety of quest styles. The only negatives are the occasional dips in sound quality, and some gamers may bemoan the relatively low difficulty. Likewise, if text-heavy Japanese RPGs don’t appeal to you, then this may not be a fit. However, fans of the genre or those seeking an original, enjoyable experience on their DS or 3DS should hesitate no longer; hunt this game down and enjoy. Glad I decided to import it now. Thanks J! And people want Xenoblade? Geez, is there gonna be enough time this fall with all these titles? I hope they don't run out of copies on Amazon by the time I manage to scrape enough money together. I've been looking forward to this game since it was first announced over in Japan. Judging from this review, it'll be well worth the wait. Thanks, T.
LOL, sorry about that Thomas. I was thanking James for grabbing the import for me. Awesome review man! I cant wait for NA release date for this. It will be one of my most highly anticipated games to buy on Nintendo DS. Great review of this game Thomas. Ugh, it is going to be such a long wait for this game coming here stateside... Guess I have Kingdom Hearts II to keep me company till' then! Yeesh, another game to import. Oh look, my wallet's on fire from how often I'm burning through it. Nice review! A pity though that I never get to play the game, since Nintendo only made a few copies of this game for Europe. I ordered it a week ago at a specialized game-shop. But still no result!!! Yes, this one has gotten strong reviews. Looking forward to it. I've beaten this game and I want more! Can't wait for this one to hit the USA. It's going to be one heck of a fall/winter. do you guys in ozzy have it yet? It isn't available in NZ for the foreseeable future. Wow sounds promising. Glad it got a good score for the sake of all the people who want it. For me, though, the "furry" concept in the game makes it a deal-breaker, no matter how great of a game it is. This doesn't totally look like my kind of game, but I love the art style and design. Another great DS exclusive:) Soooo unbelievably glad XSeed picked this up. Have it on gift list at Amazon; as soon as we get closer to release here in the 'states, I'll pre-order it. Sounds like a blast and I shall continue to look forward to stateside release. Excellent review; I'm glad you went so far as to include even the game's manual, because those sorts of things are very important, too. Great to hear that they include lots of cool info, I hope North America's does. You don't have to call it furry. ... we didn't call Duck Tales and Tale Spin and Swat Kats furry shows. We called them awesome. For me, it is a year of waiting and 6 months of informing people that has taken an end with my review being published (and much longer than yours and still spoiler free ...but in French mouahahahaha), and I'm really glad I payed attention to this title and made it my "champion"
Anyway, I can second the thoughts coming here : BUY IT ! It's impressive that NoE brought this game here. I mean, It's so public-specific (furry + mechas) and looks totally "Only for Japan". NoE are doing a very good job lately and I'm very greatful. Also, I have to say the localization is really well-done, as every game Nintendo localizes. Love this game, love it's art-direction, love the characters, love it's 60fps (my eyes told me xD I'm not sure, but is the most smooth DS game I have of 50 or so), and love all Tail Concerto's cameos/Easter eggs (nothing about this game was mentioned at the review... I recommend it to all of you!). CyberConnect2 is now one of my favourite developers! Thanks for the review! I had been hesitant because the game is 40 Euro, but now I'm definitely going to buy it. Seems to be a great game! I've seen quite a few comments that this is difficult to get hold of, but I think that Game seem to have acquired most of the UK supply. It is readily available on the high street and online at Game, Gamestation, and Gameplay. 24.99GBP online which for a game of this quality is very good. I assume they also supply to mainland Europe too. Watch this get cancelled for NA because of being too Japanesy and/or religious (I wouldn't be surprised at all). @iPruch - You're right about NoE being due praise for localising this title, as the translation is of a very high standard. I hope reports of limited availability aren't true, but as already mentioned there do seem to be some major retailers stocking this, online at least. Hopefully the NoA localisation will hit store as promised later in the year. I read about the fact this was a follow up to Tails Concerto while doing a bit of background research. I couldn't really comment as I haven't played this game, and I didn't even own a Playstation when it was released in 1999. From what I gather this game isn't widely known, plus I wanted the review to focus on why gamers should buy this game. A lack of knowledge of Tails Concerto doesn't detract from enjoying Solatorobo, as the storyline stands up on its own. NOE was only involved in Marketing and distribution, and therefore deserve no praise. This was all Namco-Bandai's doing. NOA will also not be involved in the NA release at all, so if the localization is praise-worthy, then it will be XSEED that deserves it. Also, I agree with Skotski's view, you don't have to see it as "furry", the way we didn't see our favorite cartoons as "furry". It's just a game that happens to have anthropomorphic characters. "NOE was only involved in Marketing and distribution, and therefore deserve no praise"
And they did a very bad job! How dares Nintendo informing us about the downloadable quests on the Dutch Nintendo site, when it's nowhere available in Holland! Well, maybe via a online shop. But that's not my style! I want to buy it in a "real" shop! I have ordered it at a specialized game-shop, but I am still waiting! Nintendo failed!!! "I read about the fact this was a follow up to Tails Concerto while doing a bit of background research. I couldn't really comment as I haven't played this game, and I didn't even own a Playstation when it was released in 1999. From what I gather this game isn't widely known, plus I wanted the review to focus on why gamers should buy this game. A lack of knowledge of Tails Concerto doesn't detract from enjoying Solatorobo, as the storyline stands up on its own"
Wikipedia says Solatorobo is the third game in the Little Bronx series. However, on Youtube I can only find footage of Tail Concerto and Solatorobo. I would love to see some footage of that third game! @Mickeymac - I see, well credit to Namco-Bandai then! I wondered whether NoE had helped or encouraged the localisation in any way, but whatever the case it's good news that this game has made it to Europe. At the very least NoE are making it available here, and hopefully XSEED will make the NA release happen. Great Review. I will definitely be picking up the game when it comes to America later this year. Seems really interesting and I love a good story. Why do the pictures keep changing? @Mickeymac - At the back of the box I can read: "Namco Bandai Games Europe [...] Distributed by Nintendo of Europe", so I thought Nintendo made the translation since Namco Bandai is doing so badly at Europe (or at least at Spain: Almost every RPG I want from them arrives exclusively in English). I'm glad they are changing the way of doing things here (I hope they localize Tales of the Abyss). "According to an interview by Christian Nutt of GameSpy, CyberConnect2 is restricted from making a sequel by Bandai due to the relatively low sales. CyberConnect2 tried to pitch Tail Concerto 2 to Bandai in 2003 and 2004, but Bandai rejected the project because they believed the game wouldn't sell. However, the company did indirectly return to the world of Tail Concerto in 2005 when it designed the image character "Mamoru-kun" for Fukuoka Prefecture's disaster-warning email program of the same name. The promotional materials for the program reveal that Mamoru-kun and his friends live in the country of "Nipon," which, along with Tail Concerto's Prairie Kingdom, is part of a larger world called "Little Tail Bronx." Thanks for the information! Yeah, it could be right that the third game is not a actual game but the program you mentioned. Man, sounds like CC2 finally made a game with some great gameplay to back up their awesome stories. I'm so psyched for this game. @ThomasBW84 Regarding difficulty, it increases when you do a second or third playthrough (Enemies become harder to beat and deal more damage to you), so even experienced players may find it challenging. Also masochists can always drop the upgrades for a more intense difficulty. Got this yesterday.Put about 3 hours into it so far and I am really enjoying it. Its got such a nice vibe and really does look like a Ghilbi film! Really glad I heard about this game as I've finally got something else to play on my 3DS other than OoT. Gosh, what a hectic yet brilliant year so far. 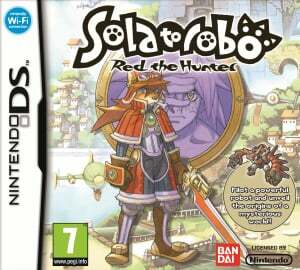 In my opinion, Solatorobo: Red the hunter was the best DS game of the year 2011 and is perhaps one of the best DS game of all time (because of its quality music, stunning visuals and action packed gameplay full of mechas and speaking furballs). The main character (Red Savarin) riding his Dahak robot, along with his companion (Chocolat) are freelancer mercenaries who accomplish quests posted at a trade broker. To make a living, they travel across the beautiful floating islands of the Sepherd Republic by plane (Asmodeus). Rewards are rings (the money used) or P-crystals (for expanding robot customization space) or custom robot parts (for improving your abilities). 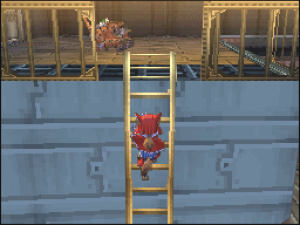 Solatorobo offers many gameplay twists unseen in any other video game so far. It is full of creative ideas. For example the fighting itself, where you cannot just punch the opponents, instead you can grab them, lift them, turn them over and throw them against other opponents. Your robot can grab the bullets and bombs of enemies which can be thrown back to the sender. At some quests you can operate a machine gun or a gun turret, where you have to load the necessary ammunition first. The opponents are very imaginative mechas and beasts. The quests and side-quests are highly varied and interesting, helping to get familiar with the main characters. You can participate in many activities such as crab fishing, ore mining, air racing (which is also available as a separate game mode directly from the start menu, playable as a multi cart wireless multiplayer game such as Mario Cart with different tracks and racing aircrafts). You can participate in quiz contests as well and fight in a separate duel arena against other characters or beasts (sometimes with special rules like you cannot receive a single hit, otherwise you fail). My favourite part was when I had to fight droids and their control ships flying my robot through a series of mini islands. 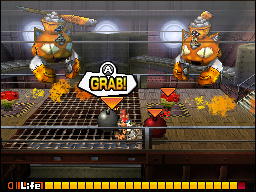 Later, 4 robot types become available, each with different skills and appearance. You can buy or receive different custom parts to boost the performance of your robot in various fields (such as hydraulics, attack, defense, movement speed and life revival). The greatest merit of Solatorobo is still its incredible 3D environment which is presented using an amazing and truly vivid graphics. There are birds, flags, aircrafts and moving elements everywhere in the backgound. The intro and cut-scene animations are also amazing. The musical scores and background sounds are also top notch. There are even some distinctive voices for every speaking character (mainly French words). In the cabin of your airplane (called Asmodeus) you can replay any collected cut-scenes, musical scores or browse your photo album or explore a library of the involved world. You can save your gameplay here or at frequent physical save spots or at the end of story chapters. I recommend to unlock the 12 bonus side-quests connecting to an Internet Access Point before the main story ends (in the European version). It took me 56 hours to complete the main story and almost every side-quests. It is very unfortunate that world-wide sales are disappointing, because I also would like to see a sequel.